On campus, we provide multiple programs throughout the year with outstanding scholars in the field of literacy. Our work is year round and designed to suit the needs of those who work with us. During 2017-2018, we presented 6 conferences. 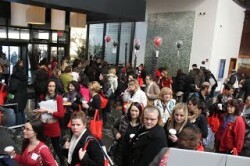 The Rutgers Reading and Writing Conference had 1100 professionals in attendance. Visit our Services page for a full description.